So pleased “Lillian” was given a whole page! “Antennae of Inspiration: The Insect Art Project” by Out Of Step Books is available here. 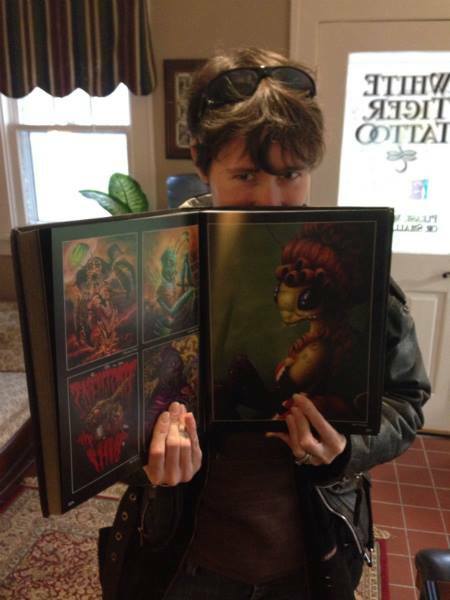 It’s a pretty huge book full of the most awesome art from all over the world. Proceeds go to school art classrooms. They also have a cephalopod book, “Eight Arms of Inspiration: The Octopus Art Project” and bird and skull related books in the works. Well worth checking out! This entry was posted in Victorian mantis project and tagged acrylic, Antennae of Inspiration, art, book, painting, praying mantis project, victorian mantis project. Bookmark the permalink.